I wanted to make some Easter-ish cards this year, but I found myself resisting the idea of hearts and flowers and happy little bunnies. So, after doing a more standard Easter egg sort of card, I allowed myself to do something a little more to my own tastes. This image is extremely loosely based on the works of HP Lovecraft, and the horrific Elder God Cthulhu, who waits and slumbers in R’lyeh, down under the vasty deeps. Mostly it’s just a little tentacle monster hatching to give someone an unpleasant surprise. 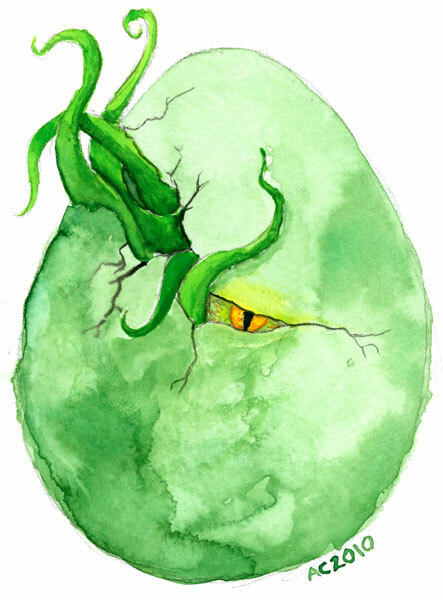 Cthulhu Egg, 4″x6″ watercolor on a watercolor postcard, sold.